Lunch was Kirsten’s Breakfast Salad (yes, again!) with sautéed shallots and cabbage, three scrambled eggs with Colby Dill Cheese and Almond Milk and some roasted red skinned potatoes. It’s official; I absolutely dig cabbage. Later on in the day, I did some more snacking. 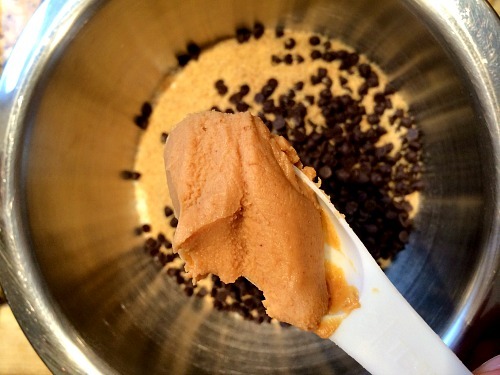 This time I enjoyed a mouthful of peanut butter, while making a batch of Energy Bars. Dinner was a rare night out for Mexican food. I consumed far too many chips with salsa and even more margaritas. My main course was two veggie burritos, rice and beans, also known as a plate of heaven. I ate it all, save one burrito, which I had for breakfast the next day. Waste not, want not. There you have it. A full day of eats, sans sassy speech, which actually allowed me to be brief for once. While it might not be the most entertaining of posts, at least I got to work on my New Year’s Resolution to write shorter posts, so there’s that. 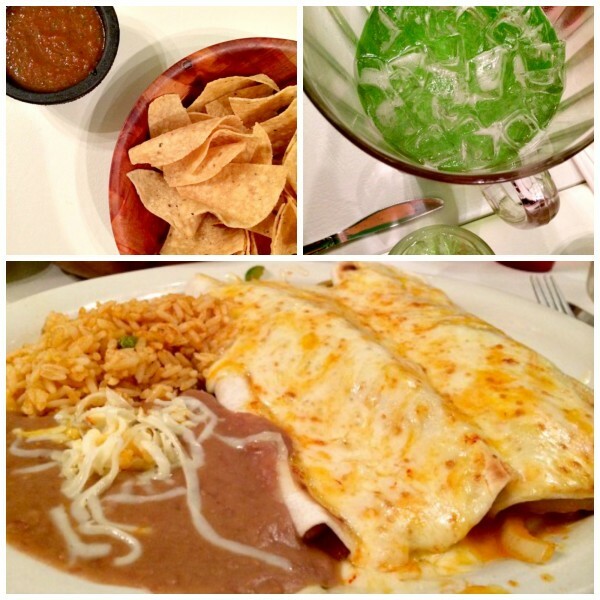 What’s your meal look like at a Mexican restaurant? Do you refrain from the chips and salsa or go to town? Do you hold back on the booze? If you’re a blogger, do you still participate in WIAW even if you have nothing to say? Oops. It’s the cheesy goodness that I love at Mexican restaurants, though it’s been ages . . . I think a place in Ft Wayne during a wheelchair basketball tournament, actually. I’ve discovered the trick to semi-recreation at home: I buy a bottle of margarita mix complete with tequila, toss it in the Vitamix with ice and frozen fruits that I’d put up last summer and blend away. After a pitcher of those it doesn’t really matter what I fix, as long as there’s some chips, salsa, and cheese. Yesterday, made hopeful by the brief sunny 60s weather, I took it one step further. I picked up a can of limeade concentrate for the kids, made them strawberry limeade smoothies, then dumped in the margarita stuff and we had strawberry lime margaritas with our ‘use up the white bean and pepper dip–that is good but no one wants to eat–by spreading it on a tortilla, topping it with copious amounts of cheese, and making quesadillas. I also discovered avocado verde, which is delicious and I’ll probably officially mash the next avocado into a cup of my put up salsa verde on purpose. WHERE DO I FIND THIS DILL CHEESE YOU NAUGHTY FOODIE TEASE?!?! I get a lot of my cheese from the Cheese Man at the Farmer’s Market, and he always has really different and creative flavors. His brand is Meadow Maid; maybe you can order it online. And reel them in, you do. I always eat the chips and salsa. And, if they have good margaritas (not the sugary drink mix stuff), then I booze up too. I love a fresh marg. My boyfriend pilfers the samples at the grocery stores too. Especially the potato chip samples. Costco is his smorgasbord. Costco is like free food heaven, although I tend to stay away because I never know what’s in that stuff. My grocery store is a different story. Then I dive right into the free samples. One of my most favorite cheeses is Havarti Dill, but I am yet to find the Colby Dill. I better get searching. We just got back from Mexico, I can still taste all the cheesy goodness. Oh yes, Havarti Dill is delicious too. I’m a big fan. Welcome home! I bet it feels great to back, yet you probably miss vacation life all at the same time. Oh, yummy to everything!! Need to get my real blender for smoothies. Of course with my freezer issues, nothing really freezes so it’s not quite the same. Guess I’ll stick with the Magic Bullet until I can have frozen fruit to make the smoothie worth the bigger appliance! Have a great day! I hear great things about the Magic Bullet so I bet you do just fine with it. Enjoy your smoothies. Bookmarking that breakfast salad again. We’ve got tons of potatoes. Is that white-colored dried fruit mango? At first I thought it might be those little yogurt bits that I’ve seen in dried fruit mixes before. Looks like a great snack. Well, my meal at a Mexican restaurant used to be hamburgers. Baha. I know, the waiter almost keeled over when I ordered one. Lol. But I like most mexican food. Crunchy tacos, taquitos especially. Nothing can beat the nachos and white queso dip at the beginning of the meal though. The breakfast salad is so delicious and really easy. Since I’ve been roasting pans of veggies ahead of time lately, I’ve just been plucking out a few potatoes and adding them, making it even easier to make. Hamburgers at a Mexican restaurant?! Oh Madison. At least you were loving on the queso dip. What can I say? Sometimes the cat has my tongue…not literally because that’d be weird. Mexican food is also my downfall. So many things at a Mexican restaurant that I have recently chosen to stop eating. We were on vacation two weeks ago and I had steak (bisteca mexicana), refried beans, the rice, and lots of avocado. I LOVE avocado. I was supposed to split one of those monster margaritas with my husband but the waiter got our order mixed up and brought us two, and when we insisted we had only ordered one, he said the second one was on the house. Oh well. It was just one night of indulgence and then back to clean eating the next day. Such a bummer you’re no longer eating those foods. I usually try to limit my intake of the less than healthy stuff, but I do like to dabble from time to time. Holy Mexican goodness, that plate has my stomach making all sorts of weird noises! If we’re going out to eat, I’m going to make it worth my while. Go big or go home. It is my humble opinion that there’s no such thing as too many chips or too much salsa… I’m not a happy camper unless I have an abundance of both. Cheese helps too. As does guac. And that breakfast salad is calling me name… I’ve been craving eggs and potatoes like a crazy woman lately, so I have a feeling that tomorrow is going to end up being a multiple breakfast kind of day. You’ve been crazy eggs and potatoes? What? Who are you and what have you done with Amanda? Ha! 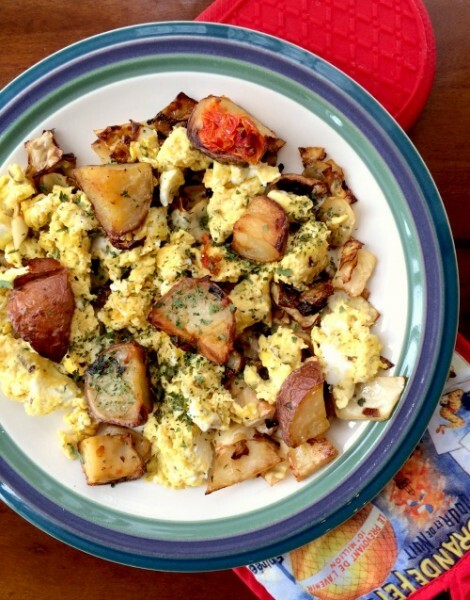 Eggs and potatoes are a good staple weekend breakfast for me or a good weeknight dinner. Thanks! Sometimes I seem to be wittier when I say I’ve lost my witty. I lost steam after that opening paragraph though. Oh well, such is life. I have no doubts you were getting sacuy in the kitchen, even if no actual sauce was made. And if you can’t seduce us with wit… well at least you have cheese. This looks like a delicious day eats from the double banana smoothie to the energy bars, but I’m mostly loving the sound of that dill cheese. I don’t drink the boozy goodness, but I run TRAIN on some chips and salsa at Mexican restaurants. It’s quite dangerous actually. Danger is your middle name! I think you had plenty to say! You need to give yourself more credit. Mexican food is glorious although I don’t do cheese so it limits my options. Thankfully, I love fajitas and no cheese means more chips and salsa. Chips and salsa are beautiful things. We had a meet up with the girls at a mexican restaurant last Thursday, and I was super proud of my restraint at the chips & salsa, though I did have some. Most Mexican places around here are just way too heavy of food for me, which is probably for the best. I even discovered that though I don’t really like beer, a super cold corona light hit the spot! I think having some chips and salsa, without going overboard is super impressive. Kudos to you. I’ve found if I save one burrito for later, I can enjoy my food without feeling like I need to be rolled out of the restaurant when I’m done. I’ve started to get quite adjusted to the ebbs and flows of blogging. Sometimes you’ve got it, and sometimes you’re just trying to stick with a consistent schedule. You have a great weekend too. Thanks for stopping by. Never come to Australia for Mexican. c) Rice and beans are extra. e) no hot sauce bottles on tables. You need to pay for that too. You are making me more than a little sad for Australia. It sounds like everything is super expensive and your cheese options are severely limited. Maybe I can sneak bricks of the good stuff in my suitcase if I ever come. you belong in texas. endless chips, salsa, guac, and burritos… daily. Ever tried avocado in a smoothie? The thought of having avocado in a drink sort of grosses me out but lots of smoothie drinkers do it, and I wonder if you the tried it yourself? I have not tried avocado in smoothies, but I have seen it done before. Avocado is pretty flavorless so I bet you wouldn’t taste it, but it would add a creamy consistency. Smoothies aside, I have eaten avocado in chocolate pudding before, and it was delicious. My Mexican plate looks almost exactly like yours, except I always ask for a side of guac. And of course it is the time to indulge in some chips and drinks!! Ole! When it comes to Mexicans, I’ll take whatever I can get….oh hell, I mean when it comes to MEXICAN FOOD, I’ll take whatever’s covered in CHEESE! And gimme all the booze…much easier on the conscience if you have an excuse for the momentary loss of scruples! You can keep your beans and rice though…those are a hard limit, I mean DEAL BREAKER for me! Ha! How about I just eat your beans and rice for you? After all, I’m still working on getting some back!